Wear a personal reminder of life's milestones with this recycled sterling silver necklace. Carrying a hidden message to remind you of your most treasured moments, this gorgeous necklace by Saundra Messinger was inspired by a peaceful river current and the sunshine that danced across its rippled texture. Moved by memorable events in her own life, Saundra created this recycled sterling silver, matte-finished pendant as a representation of how she visualizes a year--a meandering, yet linear timeline, punctuated by moments that sparkle. This gorgeous necklace brings that concept to life, offering twelve notches to signify each month in the year, and up to three year bars. Important events are marked by a conflict-free bezeled diamond in a spot of your choice (up to three diamonds in one notch), so you can wear a personal reminder of weddings, births, and memorable milestones. After hand casting and finishing each pendant, Saundra drops your diamonds in their place, knowing that a special occasion or person is being honored and held close to your heart. A sweet and private way to commemorate special memories, you can add up to six diamonds, so your timeline can be as rich and lustrous as your own life. Handmade in New York City. For more styles from Saundra Messinger's Milestone jewelry collection, take a look at the Milestone Bar Necklace and Milestone Bracelet. The Milestone jewelry collection is designed and made by Saundra Messinger. A former singer and clothing design executive, Saundra began making jewelry in 1999, and incorporated her business in 2001. Her jewelry designs are funky, elegant, confident and cool. The imperfect geometric shapes are reminiscent of the sea glass produced by the two rivers she loves, the Mississippi and the Hudson. Women are drawn to the uneven surfaces, shimmering matte finish, tiny sparkling diamonds and expert craftsmanship. The hard metal and soft finish of her necklaces are symbolic of the women who wear them: strong, yet feminine. She says, without a doubt, the most important and exciting thing since becoming a jewelry designer is when she sees a woman wearing her designs. Saundra Messinger's Milestone Bracelet offers an elegantly abstract design that commemorates landmark dates such asweddings or anniversaries. 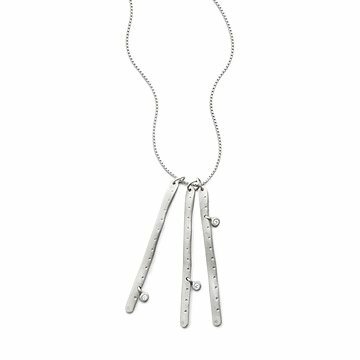 Each arrangement of conflict-free, bezeled diamonds hung along recycled sterling silver, matte-finished bars represents a special date through a thoughtful, calendar-like concept and beautiful, natural materials. "Our mission is to produce sterling silver jewelry using sustainable and conflict free materials, while working in a fair and respectful manner with our customers, suppliers and employees." Saundra Messinger pays employees a starting wage of $15/hr., which exceeds Rockland County's living wage. Saundra Messinger provides her employees with two weeks of PTO. The company has a recycling program in place for their silver and gold castings. They return those materials to their caster when they have returned or discontinued merchandise, and return the excess metal on raw castings. Such returned materials are melted and put into future orders. For many years, Saundra Messinger donated 5% of sales of a particular earring to MS. They have donated generously to the MS Society, IFAW, Rockland Family Shelter, Humane Society of Memphis, and others. Sterling silver and 2 pt. conflict-free diamonds—both natural source materials. The Milestone Drop Necklace is packaged in a partially recycled, recyclable and compostable jewelry box. There's one place—and only one place—where you'll find the Milestone Drop Necklace: UncommonGoods. To restore finish, use whitening tooth paste (with baking soda in it), cool water and a scouring pad. A maximum of 3 stones can be added to a single notch. This is a made-to-order item. If you order today your item will ship no later than 5/22/2019.